Quang Ha received the B.E. degree from Ho Chi Minh City University of Technology, Vietnam, in 1983, the Ph.D. degree from Moscow Power Engineering Institute, Russia, in 1993, and the Ph.D. degree from the University of Tasmania, Australia, in 1997, all in electrical engineering. He is currently an Associate Professor and Deputy Head of School (Research) of Electrical, Mechanical, and Mechatronic Systems, University of Technology Sydney, Australia. His research interests include automation, robotics, control, and computational intelligence. Dr Ha is a Senior Member of the IEEE and on the Board of Directors of the International Association of Automation and Robotics in Construction. He has been a Member of the Editorial Board of the IEEE Transactions on Automation Science and Engineering (2009–2013), Automation in Construction, Mathematical Problems in Engineering, International Journal of Automation and Control, and Journal of Advanced Computational Intelligence and Intelligent Informatics. 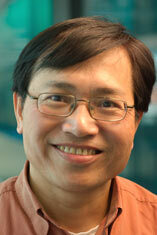 Quang Ha was the Chairman of 2 International Conferences on automation and intelligent systems. He was the recipient of 14 best paper awards from the IEEE, IAARC and Engineers Australia, including the Sir George Julius Medal in 2015.